Naaman was a great soldier, but he had a skin disease called leprosy. 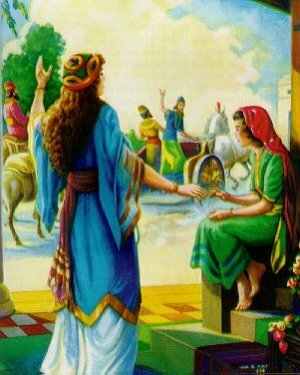 A young girl from Israel who was a slave, served Naaman's wife. She told about a prophet who could cure his leprosy. Naaman's king sent a letter to the king of Israel asking him to cure Naaman. The king of Israel was upset because he knew he had no such power. Elisha, a man of God, asked to see Naaman. He told Naaman to wash seven times in the Jordan River. Naaman was angry because he did not expect to be cured this way. He thought Elisha would wave his hand over him and cure him. He also thought the rivers in his country would be better than the Jordan River. But he decided to obey. He dipped one, two, three, four, five, six, seven times. When he obeyed what had been told him, his leprosy was gone. He was so happy! He said, "Now I know the God of Israel is the only God." You may not understand the reasons behind what your parents require of you, but just obey. They have had more experience and know of pitfalls that you may not be able to see. Many things can be learned vicariously (through the experiences of others), and you can be spared the consequences of some bad decisions. This story about Naaman can be found in the Bible in Second Kings chapter 5. English Bible Activities Select story #107 in the list for activities to accompany this Bible story. Spanish Bible Activities Select story #107 in the list for activities to accompany this Bible story. I am really empressed with this site, and to tell the truth I am almost a 60yr old man, that wishes, he knew so much more about God's Word than I do. Thank You for all the area's you have, I hope to share it with my Grandson and the Childrens teachers at our Church so they can use these powerful tools you have provided. Praise JESUS ! Thank you so much for all the info. This site has some really good stories and are put in a way that the kids will understand and i can elaborate on them. Thanks lots, your activities/ lessons have helped me and my Sunday school as well. May he richly bless you! This story is very useful to understang God better!! Thanks my Sunday school children love the word searches. God bless. This page displayed 152,692 times.